is one of the largest mycological societies in the country. We share our knowledge about mushrooms through meetings, classes, workshops and field trips. Please join us at a meeting or become a member today! Spring 2019 "Hildegard Hendrickson ID Clinics" will begin on Mon. Apr. 29th! Mushroom MAYnia will be held this year at the Phinney Center Community Hall on Sunday May 19th! Family Fungi Fun! Mushroom MAYnia showcases safe cultivation, hunting and harvesting methods and arts and crafts all created from our fungi friends. Educational and fun for the whole family, including foraging tips, cultivation information, nature walks, mushroom talks, truffle flavored popcorn and fungi crafts! More info here. $5 per family, $3 per individual. Sunday May 19th, 12:30pm to 5pm at the Phinney Center Community Hall. Check out the PSMS Blog! Spore Prints is the monthly newsletter of PSMS containing announcements of coming events and speakers, plus a variety of tidbits, trivia, recipes, and research developments. Washington state is divided into numerous federal, state, local and Native American jurisdictions. Learn the proper rules for each jurisdiction. Doors open at 6:30 pm at the Center for Urban Horticulture. Come early and bring any mushrooms you want identified! The University of Washington Herbarium is the Burke Museum's botanical research collection. Founded in the late 19th Century, the Herbarium comprises five collections: macrofungi, lichenized fungi, vascular plants, nonvascular plants and marine algae. Of the Herbarium's 700,000 specimens, over 75,000 are macrofungi and nearly 32,000 are lichenized fungi. The Herbarium's fungal collections are an invaluable resource for professional, academic and amateur mycologists alike. In this presentation David will provide a brief history of the fungal collections, review the substantial efforts made over the past decade to enhance access to these collections and discuss ideas about the collections' future. David Giblin has been Collections Manager of the UW Herbarium since 2002, where he oversees the plant, fungal and marine algae collections. 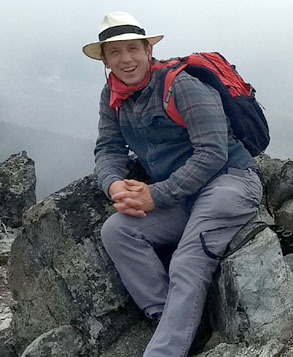 His research interest is the vascular plant flora of the Pacific Northwest, where has led plant collecting trips from Washington to northern Nevada and eastward to Idaho and Montana. In the collections he has led efforts to database and image the collections and he led the creation of online resources such as the Consortium of Pacific Northwest Herbaria and the Plants and Fungi of Washington Image Gallery. He is lead editor for the Flora of the Pacific Northwest, 2nd edition, co-author of print wildflower guides to the Olympics, North Cascades and Mt. Rainier National Parks, project lead and contributor to the Washington Wildflower and Idaho Wildflower plant identification apps and editor and board member for the Flora of North America project.